Neolithic building on vast site at Marden Henge is welcoming public visitors again after thousands of years buried beneath farmland. Pieces of flint tools dropped more than 4,300 years ago on the floor of a house as old as Stonehenge have been laid bare on the edge of Marden Henge, a giant ditch and bank enclosure so buried in rich Wiltshire farmland that it has almost vanished from view. The rectangular building will welcome visitors next weekend for an open day which is part of the national festival of archaeology. The house, believed to be one of the best preserved from the period ever found in the UK, and made to look smarter with tonnes of white chalk brought from miles away and stamped into a kind of plaster, is as neatly levelled and regular as the nearby postwar bungalows built on top of part of the henge bank. The house and other parts of the huge site have already produced finds including beautifully worked flint arrowheads and blades, decorated pottery including some pieces with the residue of the last meals cooked in them, shale and copper bracelets and a beautiful little Roman brooch – and the tiny jawbone of a vole. Analysis of the mass of seeds and charred grains recovered will reveal what the people were growing and eating. Pig bones – probably the remains of at least 13 animals, food for hundreds of people – and scorch marks from a charcoal firepit suggest the house was never a permanent residence but connected with great gatherings for feasts. When it was abandoned the entire site, pig bones and all, was cleaned and neatly covered with earth, so it would never be used again. The structure originally stood on a terrace overlooking a mound, within a small earth-banked circle, in turn part of the enormous Marden Henge. Leary, joined by archaeology students, professionals and amateurs from all over the world, who will continue working on the site for years to come, is peeling back the layers of a monument that was once one of the biggest and most impressive in Britain. Ramparts three metres high enclosed a vast space of 15 hectares, far larger than the Avebury or Stonehenge circles, and too large for any imaginable practical use. 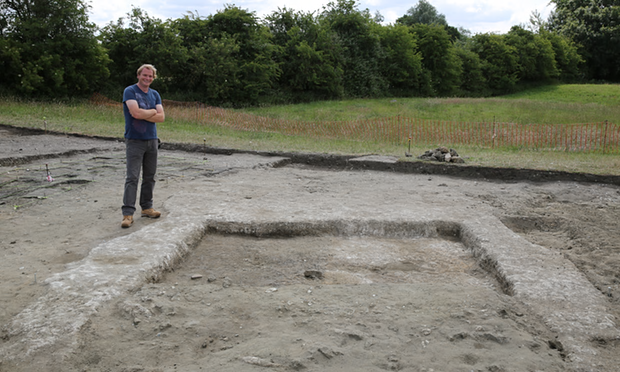 The site is so vast that it takes Leary and fellow director Amanda Clarke 40 minutes to walk from the team working on the house to the diggers who have uncovered a previously unrecorded Roman complex including the foundations of an impressive barn. Like the Durrington Walls henge a few miles downstream, and Stonehenge itself, Marden was linked to the river Avon by a navigable flow, now a sedge- and nettle-choked stream, which forms one side of the henge. Marden’s banks, cut through by later roads or lying under modern farm buildings, grazing cows and ripening crops in many places, once stood three metres tall, towering over an equally deep ditch. The outer ring enclosed a complex of smaller monuments, including the Hatfield Barrow, which was once 15 metres tall, and now survives only as a 15cm ripple in the field. It was excavated in 1807 and, after a collapse caused by the shaft, later completely levelled by the farmer. The site welcomes visitors every day, but the open day will have finds on display, tours and activities. It will be among more than 1,000 events across the country over the last fortnight of July, including lectures, site tours and visits to archaeology stores and structures normally closed to the public. The Reading University archaeology summer field school open day takes place at Marden Henge, Wiltshire, on 18 July. 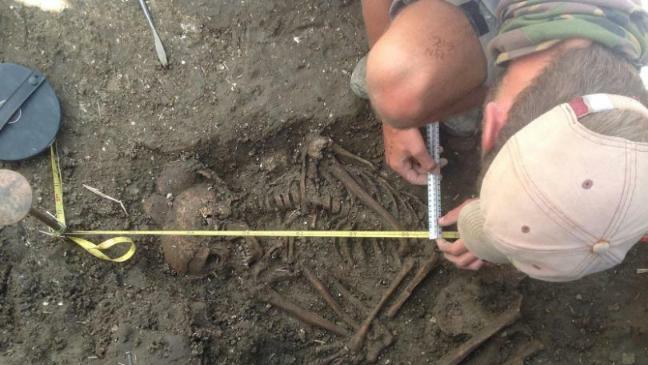 The Council for British Archaeology festival of archaeology runs nationwide from 11-26 July. Avebury Stone Circle: Mystery and secrets all set in stone. MARK THORNTON (Western Australian) finds ancient tales and spirits permeate at prehistoric Avebury. What’s the connection between a prehistoric English monument older than Stonehenge, marmalade and a Victorian MP? The English prehistoric site is the Neolithic stone circle at Avebury in Wiltshire. The MP is Sir John Lubbock, who bought it in 1871, and the marmalade connection comes from Alexander Keiller, who made his fortune from the confection and used it to buy the site 20 years after Sir John’s death. Avebury, encompassing 11.5 hectares, is the largest prehistoric stone circle in the world. Construction was intermittent and spanned hundreds of years but was completed around 2600 BC. It’s 14 times larger and 500 years older than Stonehenge, 30kms to the south. As with Stonehenge, many people have theories as to why it’s there. One is that it was the focal point of large-scale religious ceremonies and rituals during the Neolithic and Bronze ages. Another is that the shape and alignment of the stones, which have almost geometric precision, suggest it was an astronomical observatory. Antiquarian Dr William Stukeley first visited the site in the 1720s and after 30 years research, claimed the original ground plan of Avebury represented the body of a snake passing through a circle to form a traditional symbol of alchemy. Other researchers have since said it was a centre of science, learning, pilgrimage, a cultural meeting place for regional tribes, and even a hub for extra-terrestrial activity—though this suggestion was made in the 1960s when hippies with vivid imaginations, and often heightened sensibilities, discovered the site. Sadly whoever built Avebury left no written or pictorial clues. The site consists of a circular bank of chalk 425 metres in diameter and six metres high, enclosing a ditch that was nine metres deep when dug but after 4600 years of weathering, still has a depth of more than six metres. Archaeologists estimate the ditch would have taken nearly 300 people 25 years to complete and required 200,000 tons of rock to be chipped and scraped away with crude stone tools and antler picks. This suggests a sizeable, stable and well-organised local population lived at the site with a successful agrarian economy able to support the build. However, they had disappeared long before the Saxons built a settlement there 1500 years ago. The word Avebury probably comes from Ava, the Saxon leader at the time. Inside the ditch there is a circle of 27 sandstone pillars, each weighing up to 50 tons. There used to be three times that many, but over the past 1000 years local villagers used the site as a quarry for building materials. Inside the circle of sandstone pillars are the remains of two smaller stone circles, each originally consisting of about 30 uprights and each about 105 metres in diameter. At the centre of the southern inner circle a tall obelisk once stood surrounded by smaller boulders. It’s a big and impressive site, and due to the presence of Avebury village, built inside the ring of stones with its church and edged by some ancient large trees, it’s softer and less foreboding than Stonehenge. Nonetheless, it has a strong sense of mystery. Four huge beech trees stand out, each with a spectacular tangle of roots spread over the surface of the chalk bank. Locals call them the Tolkien Trees, claiming J R R Tolkien was inspired by them to create the Ents for Lord of the Rings. Meandering among the stones in the late afternoon under a lowering sky it’s easy to give your imagination free rein. How the village encroaches within the outer stone circle. Avebury is more accessible than Stonehenge, which is now fenced off and requires you to buy your $30 admission tickets— that only give you two hours on site— in advance. Avebury has no admission fee, fences or closing times and you can walk among the ancient stones and mounds as long as you like, soaking in the mystery. Some people even camp among the stones. It’s this ambience that attracted Sir John Lubbock and later marmalade baron and amateur archaeologist Alexander Keiller. Sir John, a close friend of Charles Darwin, was a visionary whose main political agendas in Parliament included promoting the study of science in primary and secondary schools and protecting ancient monuments. He invented the terms ‘palaeolithic’ and ‘neolithic’ to denote the old and new stone ages. He bought Avebury in 1871 when the locals seemed bent on destroying it by using the ancient stones as building material. Some cottages still have large pieces of the standing stones as massive cornerstones. Sir John was responsible for the Ancient Monuments Act in 1882, the first piece of legislation that protected archaeological sites, paving the way for English Heritage. Pious locals had begun destroying the site more than 1000 years earlier with the encouragement of the Christian church, which controversially urged the destruction of pagan symbols, yet was not averse to encouraging the villagers to build a church in the village from those same ‘pagan’ stones. During his tenure and oversight of repairs Sir John discouraged any more building within the site, describing the village and its church to be “like some beautiful parasite (that) has grown up at the expense and in the midst of the ancient temple”. When he was raised to a peerage in 1900 Sir John chose Avebury for his title, becoming Lord Avebury thereafter. Avebury’s church is in line with the innermost stone circle. Keiller bought the site, including the entire village with its then population of about 500, in 1934 with the intention of completing Lord Avebury’s work in restoring it. He knocked down cottages and farm buildings to remove human habitation from within the stone circle and re-erected fallen stones and set concrete markers in places where stones originally stood. In doing so he both upset and impressed villagers, who soon came to accept him as a well-meaning eccentric who brought work to what was a poor community. He spent the equivalent of $4 million in today’s money on the restoration, which includes a magnificent museum. He sold the site to the National Trust in 1943 and his widow donated the museum to the nation in 1966. The museum is worth a visit on its own. Particularly fascinating is its collection of ancient jewellery made from rare metals and bronze, many featuring semi-precious stones. Although made thousands of years ago, the jewellery has in its perfect simplicity a timeless style and beauty. Avebury is well worth a visit, not just for itself, but for a number of other prehistoric sites nearby, including Silbury Hill and the West Kennet Long Barrow (a burial mound), both of which are several hundred years older than Avebury. Together they lie at the centre of a collection of Neolithic and early Bronze Age monuments and all are part of a World Heritage Site in a co-listing with Stonehenge.